A cosy and spacious family-run hotel, Kristalli Hotel Apartments feature bright studios with modern amenities. 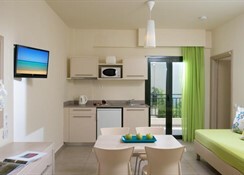 Guests can enjoy access to the Malia Beach at 2 km from here. The easiest way to reach the property by air is via Heraklion Airport at 30 km from here. Various bars, clubs and restaurants are at a 10-minute walkable distance from here. Bikes are available for rent here at Kristalli Hotel Apartments and guests can explore the nearby places. One can also buy their daily needs and provisions at the supermarket at a short walkable distance from the Kristalli Apartments. An inviting outdoor pool is lush and well-maintained. Guests can spend a fun-filled day at the Aqua Plus water park at just 9 km from here. A free Wi-Fi is available in all the public areas of the property. 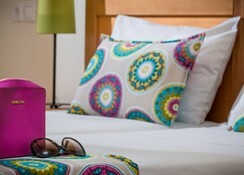 This amazing hotel is a most preferred choice for couples who are seeking a peaceful holiday. At just 2 km from the Malia Beach, Kristalli Hotel Apartments can be reached by air from the Heraklion Airport at 30 km from here. In the evenings, guests can enjoy some lively time at the Malias lively centre at just a walkable distance from here. Lixnostatis museum is located at a distance of 5.8 km and is a must-visit for those interested in history. One can visit the Aqua World Aquarium at 8.1 km distance from here. The Crete Golf Club is nearby at 10 km from the property where you can polish your golfing skills. 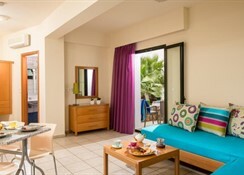 The furnished rooms offer balconies or terraces with either pool or garden views. The studios are bright and neatly furnished. Apartments can sleep up to 4 people as they have separate living rooms. 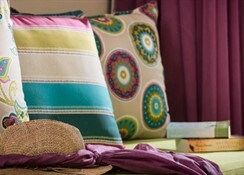 The studios are equipped with free Wi-Fi, flat-screen TVs, kitchenettes and separate sitting areas. Guests can refill themselves with the breakfast buffet served every morning on a complimentary basis. A snack bar serves some delectable snacks and exotic beverages. 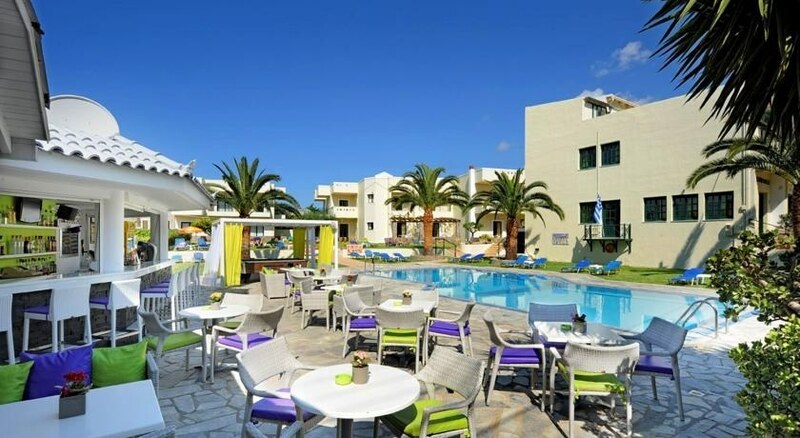 Kristalli Hotel Apartments has a swimming pool and water park and terrace where guests can soak up all the sun. There is Yoga classes and a fully equipped gym for those who wish to stay active. There is a lovely spa with steam room offering massages and therapies. Tiny tots can have fun at Kid’s Club or Playground. The hotel has facilities for Diving, Cycling, Mini Golf and Billiards. The hotel can arrange horse riding, snorkeling and fishing. Parking is complimentary at the property.